After seeing so many quotes and pictures on social media about International Women’s Day, I decided to take another spin on this topic. I was thumbing through different quotes trying to find a different message. This quote from Dolores Huerta, who is known more for her work in the farmworkers movement really struck me. First, she is an icon in Mexican-American history, and my rich heritage helped shape the strong woman I am today. Secondly, my knowledge of her historical path showed me that she was a fighter for a community who needed a voice to speak up for them (farmworkers and their families). Dolores Huerta is still alive today and she has spent the last 15 years focusing on the feminist movement and encouraging women to become active in politics. Dolores Huerta’s quote reminded me that women have to keep lifting each other up. The new campaign from Lean In (#LeanInTogether) also reminds men how important their role is in supporting women at home and at work in achieving equality. If someone’s success makes us feel inferior, threatened or jealous then WE are the real problem, not the person celebrating their success. So let’s use this week to look at the ways we relate to others. Do we operate from a place of jealousy or envy? Are we quick to judge others’ lives yet we can’t accept criticism when it could truly help us? How will you help the next generation of women? 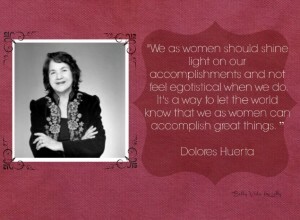 If you would like to read more about Dolores Huerta click here. Please subscribe for email notifications by clicking here. No spam! Spread love, compassion and positive vibes this week!